I just snagged this for Father's Day! Today ONLY - Insignia™ - 33-Lb. 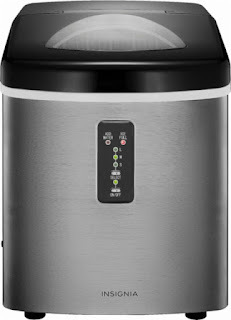 Portable Ice Maker - Stainless steel for $129.99 (Retail $149.99). Chill drinks at your next party with this Insignia portable ice maker. The compact design fits easily on the counter, while an included scoop and basket make it easy to fill drinks and empty leftover ice. With a freezing time of seven to 13 minutes, depending on cube size, this Insignia portable ice maker ensures you're never out of ice.